A glass vase, the baluster body with a flared neck. The sides cut in the so-called ‘Edo kiriko’ technique through a bright blue layer to the clear glass, with a pattern of gentle vertical swirls. ‘Edo kiriko’, or cut glass, is a manufacturing method in which clear colors and delicate patterns are cut into glass. Edo kiriko was founded in 1834 by Kagaya Kyubei, who operated a glassware store in the Odenmacho area of Edo (nowadays Tokyo). After studying in Osaka, which had developed advanced glassware-manufacturing methods, he returned to Edo and operated a glassware store that manufactured eyeglasses and thermometers. From there, cut glass gradually spread throughout Edo. In 1876, aided by the government’s policy of promoting new industries in the hope of catching up to Western industries, the Shinagawa Glass Factory was established. 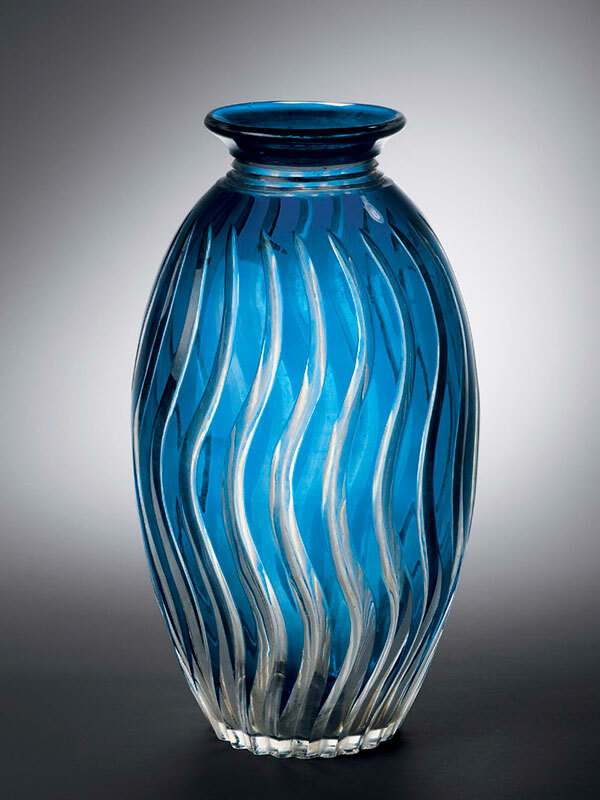 With this, the first modern glass production started in Japan. In 1881, Emmanuel Hauptmann, an English engineer versed in modern glass-cutting techniques, was invited to impart these skills to selected trainees. Consequently, by combining the techniques that were passed down since the Edo Period and the latest methodologies of modern industry, the unique style of Edo kiriko was formed.